This is Georgie’s story. Georgina Witley. She’s nearly 80 and has been invited to participate in a formal lunch at Buckingham Palace because her birthday is the same day as that of Queen Elizabeth I along with the other 99 guests who are also invited. But Georgie only gets to the end of her road where she accidentally drives her car off the road and down into a steep ravine. Georgie is thrown from the car but is injured and has no way to alert anyone. She spends several days there, with exposure to the elements. While her injuries may not be fatal, lack of food and especially water just might be. She tries to keep her mind alert by reciting the latin names of the bones in the body and remembering anecdotes from her life and her family, hoping to ward off the Grim Reaper who is ever inching closer. She doesn’t filter her memories through in chronological order as you might think. That’s just the way most minds work. She keeps herself motivated by talking ..to herself, to her late husband, to her mother and even to Death himself as she slowly inches her way to her vehicle, hoping for a little warmth and a way to sound the horn to alert someone for help. 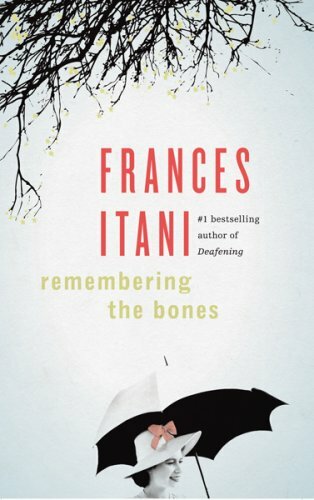 Frances Itani writes exquisitely and she writes about women, women that are vastly different from each other but all have a very true and real presence. I’ve not been disappointed by any of hers so far.